You are receiving this because you subscribed to the Australian Shepherd Lovers Newsletter. This newsletter is also available online here. Last month I shared with you that we had reached a milestone of 1 million vistors to the website. Since I started Australian-Shepherd-Lovers.com we've added what is now one of the most comprehensive Breeder Directories, we've added our Facebook page (which has a good start of well over 3000 fans) and our forums like the Aussie Q & A and Reader's Aussies forums that together now have over 1000 submissions. Then to top it off we realeased our community ebook "Australian Shepherd Lover's Guide To Australian Shepherd Training & Care." Get your copy here. Seriously though, my point is that we have a solid foundation here going forward. I want to make 2012 a banner year for Aussie Lovers and need your help to build a community and a resource we can all be proud of and join in. Want to get involved? I need your help to spread the word. Tell Aussie owners you know about our community and resources. • Are you in forums on the web? Tell members about our website and Facebook page (respecting forum rules of course). • Do you have a website? Tell your visitors about us by adding a link. More info about that here. • And I would love to see you get involved in the website. Do you know something about Aussies? Do you see a gap in information on the website? Why not write an article to help others learn from your experience? I've already posted excellent articles submitted by guest writers who have added greatly to the depth of information on the site. You can submit one article on a topic dear to your heart or consider becoming a regular guest writer. Contact me with your ideas. 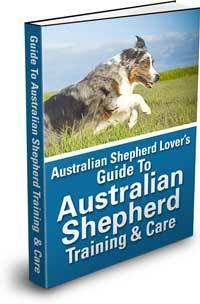 Here's to making 2012 a great year and living up to our title of "The #1 Resource for Australian Shepherd Lovers." A dog bladder infection may not seem like an urgent problem, but left untreated it can develop into a serious health issue affecting your dog's vital internal organs. Find out more about dog urinary tract infection here. Looking for dog games and dog activities? Breeder, Gayle Silberhorn, shares her tips on indoor dog games and activities you and your dog can enjoy even on days when going outside is not an option. They Even Protect Our Neighbors! This is an incredible story from Tom Carpenter about his Aussie, Chaser, that you won't want to miss. We all know how much we are indebted to our Aussies for how much they enrich our lives but sometimes even our neighbors are grateful for the vigilance and intelligence of our favorite breed! Colby is a male Australian Shepherd. He is fixed already. He is your typical lap dog. Loves being petted and given massages :) right now he is in need of a new home because he does not always get along with our other young pup. Who rescued who? At 15.5 years of age, our female, blue merle, Australian Shepherd Rescue AnnieB enjoys daily walks at Fisherman's Cove in Manasquan, NJ... keeping us "all smiles"! BoosterBath – Recommended by top veterinarians, breeders & handlers worldwide... MADE IN USA! Pays for itself in less than 10 washes at your local dogwash! Saves your back, bathroom and your time! Unique 360 Degree Access Reduces Back Strain! Shampoo caddy means no more chasing down shampoo bottle! Adjustable 3 point leash restraint system keeps your dog safe. "Dogs are our link to paradise. They don't know evil or jealousy or discontent. To sit with a dog on a hillside on a glorious afternoon is to be back in Eden, where doing nothing was not boring -- it was peace." Did You Get Your Copy of The New Ebook Yet?